To celebrate International Drink Chenin Day this past Friday, Kleine Zalze hosted a tasting of the 2013, 2015 and 2017 vintages of its three tiers of the variety, namely Cellar Selection, Vineyard Selection and Family Reserve. The entry-level Cellar Selection has become a much drier wine over time, a deliberate ploy on the part of the winemaking team to ensure greater drinkability. Even so, the 2013 with its RS of 4g/l and 5% botrytis compared to 3.1g/l in the case of the 2015 and 1.5g/l in the case of the 2017 was looking in great nick – stone fruit, pineapple and bee’s wax on the nose while the palate was generally flavourful with nicely coated acidity and a savoury finish. A very characterful drop which cost less than R40 a bottle on release – I rated it 90/100 on this occasion. The other wine of particular interest was the Family Reserve 2015 which rated 95 on release in 2016 (see here). It’s still very striking but has taken on a pronounced and somewhat peculiar herbaceousness. 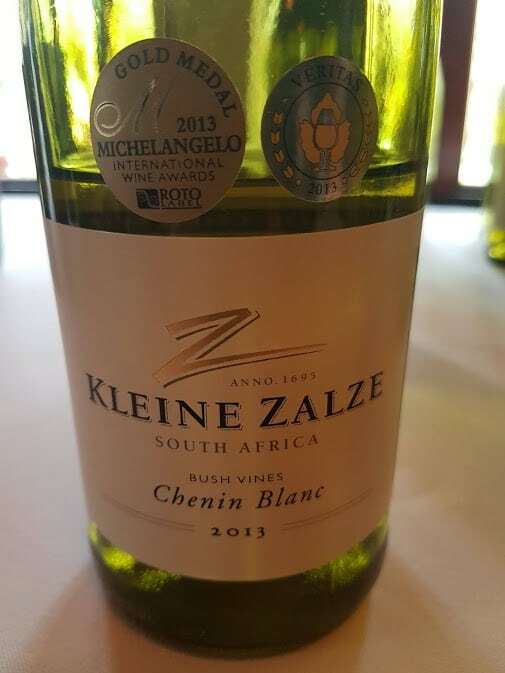 This character is something that is something I often encounter on old-vine Chenin, if not quite to the same degree, and this prompted me to ask the winemaking team of Alistair Rimmer and RJ Botha what they thought might cause it, their answer being two-fold, skin contact prior to ferment and blue gums near the vineyards both being potential factors.